On September 16th two Makara Model School students recieved GOLD awards at the annual Karori Youth Awards. Congratulations to Maddie Fraser for her award for Accademic Improvement and to Veryan Straight for her award for service to the school community. Both students are amazing role models for everyone in our school! Well done. 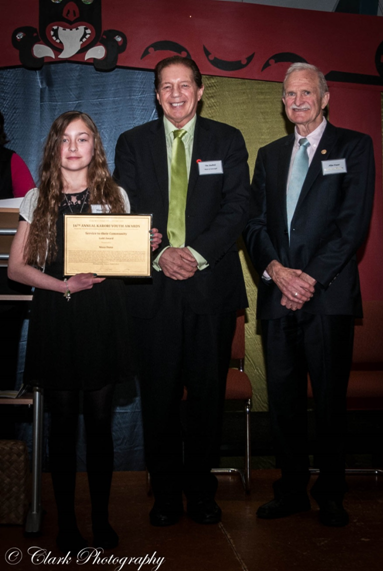 Nissa Dunn was awarded a Gold Youth Award for her services to the school community at the 16th Annual Karori Youth Awards evening held on September 4th 2014. Nissa was presented with her award by Mayor of Invercargill, Tim Shadbolt and Barry Lovegrove, Awards Convenor. Congratulations Nissa, we are all very proud of your achievements and we appreciate all you do for the school. We had a fantastic assembly to celebrate being awarded State Kiwi Swim Safe of the Year. It was wonderful to meet Emma Robinson and Isaac Foote (both regional high performance swimmers) who came along to share their experiences with the children and join in our celebration. The children made decorated cupcakes and letters spelling out SWIM SAFE SCHOOL AWARD 2014. All the children were given a set of Swim Safe Goggles (from the school) and a beautifully decorated gingerbread person (dressed in togs) donated by Meridian. The children and all our guests enjoyed the cupcakes and gingerbread people after the assembly. We are very proud to have been recognised in this way by Swimming NZ as we strive for excellence in all things. Two Wellington Regional High Performance Centre (WRHPC) swimmers visited the Swimming New Zealand State Kiwi Swim Safe School of the Year this week. 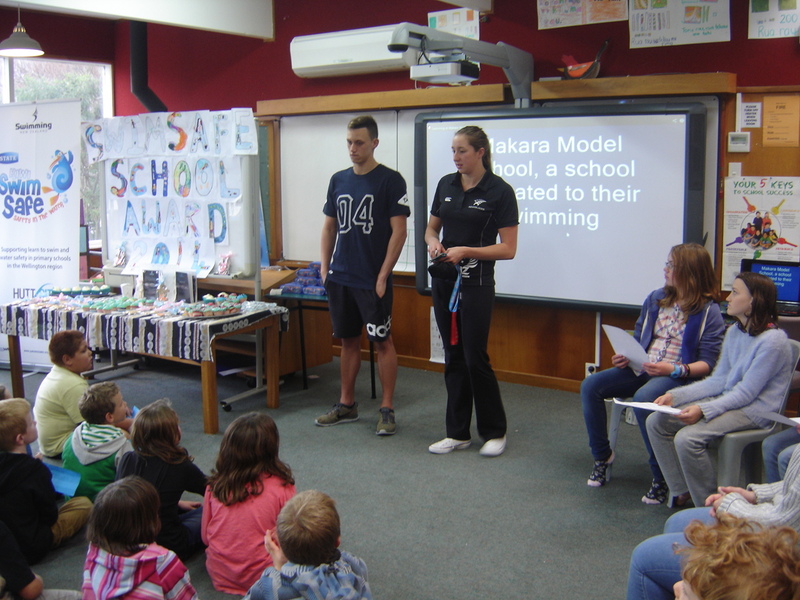 Emma Robinson and Isaac Foote stopped in at Makara Model School in Wellington on Tuesday to share some of their own swimming experiences with the award winning school and its students. The swimmers captivated their young audience with their own learn to swim stories and about the hard work they have put in to pursue their dreams to swim for the country. Both Robinson and Foote are competing at the upcoming Oceania Championships which they spoke about with the students and their parents. They also spoke about this year’s Commonwealth Games, which Robinson is competing at. Students were excited to hear about all the travel that Robinson and Foote have been able to do through their swimming, with Robinson sharing about her next trip to Spain for altitude training before the Games. Makara Model School Principal, Gail Dewar, said it is exciting that “the kids will now be able to see a swimmer that they have met actually swimming at the Commonwealth Games”. She added that the students are going to watch Emma’s races on the big screen at school and are planning to write her good luck letters too. The children also got a chance to ask Robinson and Foote their own questions. The eager audience keen to know things like who their swimming idols were and what their best swimming stroke was. Swimming New Zealand Swim Safe Advisor, Sarah Gibbison, was also there and said it was a great day celebrating the school’s award and great to see all the students talking about how much they love swimming.